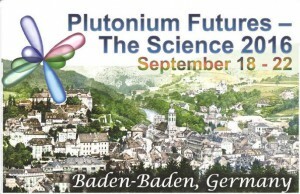 Plutonium Futures – The Science series of conferences provides an international forum for discussion of current research on physical and chemical properties of plutonium and other actinide elements in complex systems. In bringing the community together from diverse disciplines, the conference aims to enhance the dialogue among scientists and engineers on the fundamental properties of plutonium and their technological consequences. Scientists, engineers, academics and students from universities, national laboratories, and the nuclear industry are encouraged to participate and make technical contributions.